Katy Green, International Relations. Class of 2021. When I walked into my first class of Introduction to Global Politics with Dr. Baglione, I didn’t know what to expect. As a first semester freshman at Saint Joseph’s, it was hard to fully imagine what college would be like. What was even more nerve-wracking was going in as an international relations major without really knowing what that would look like. All I was certain of was that I would finally be learning about what made me passionate: international politics. After participating in my high school’s Model United Nations club, I had fallen in love with working with other “countries” to form resolutions on issues that really mattered. I soon developed a desire to make a change in the world that would impact people globally. 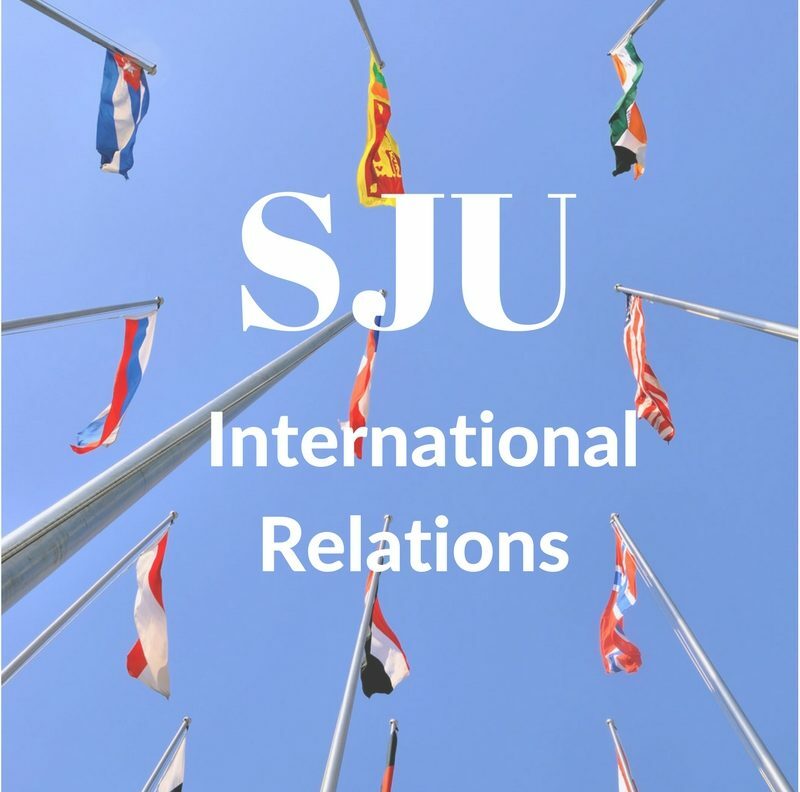 International relations seemed like the perfect fit and I felt that SJU would be the best place to help me further my high ambitions. Right away, I felt comfortable with the professors of the IR program. In the first few weeks of the semester, Dr. B sent out an email to the freshman of my POL 115 course to check up with us on how we were adjusting to the life of a college student. Knowing that my professors cared enough to reach out to their newest students brought me a sense of comfort and reassurance that I would be in good hands. When I read the theories of realists, constructivists, and liberals alike, I knew Dr. B would be there to guide me in applying what I read on paper to real world examples. I began to see the world in a different light to the point where when I checked my news app, I could identify the theories and concepts I had learned in class. It also didn’t hurt to be a leading part of the Rohingya crisis simulation to be able to apply what we learned to real life international crises! During my second semester, I took Introduction to Comparative Politics with Dr. Fukuoka. Having the head of the IR program as a professor once again made me incredibly nervous for the second course of my major. But after the first day of class, I realized I had no reason to be nervous. Like Dr. Baglione, Dr. Fukuoka was always making sure that everyone understood what was being taught and wanted to hear everyone’s opinions on the subject matter. It was hard not to succeed in POL 113 when I was so interested in the theories of democracy and comparison of the governments of China, Russia, and Nigeria to those of fully developed democratic states. I never knew how much fun it could be to talk about how the history of a country’s ruling government affected how it was in current day. With POL 115 and POL 113 under my belt, I know I’m prepared to take on my upper division courses, especially since I had amazing teachers guiding me along the way. It wasn’t just the brilliant professors of the IR department that really made me feel like I could conquer my major; it was also the other international relations students who made an effort to make me feel like I belonged to a greater community. I got my first real taste of the students of the IR program when I was given the opportunity to attend a lecture given by former Secretary of State John Kerry at Villanova’s campus. One of the service scholars of my service learning course was Dan Soucy, an IR major who has now graduated. I saw Dan as someone I could go to with any questions I had about courses or faculty. He was the person who offered me a ticket to the John Kerry event. It was there that I met other upperclassmen of the IR program who were all incredibly warm and welcoming to the quiet, nervous freshman that I was. But it’s the other international relation majors that make me feel the most included. When I meet IR majors in my class, I always get excited because I know we’ll all be getting to know each other over the course of the next three years. I see the international relations department as a sort of family and I’m incredibly lucky to be a part of it. Katy (top left) and a group of students from the international relations program after hearing Former Secretary John Kerry speak at Villanova University. As an incoming sophomore, I’ve never been so excited to go back to school. I have three courses for my major lined up in my first semester and while I know that it’s going to be a lot of work, my introductory courses with Dr. Baglione and Dr. Fukuoka have prepared me for what’s ahead. I know that I can go to my professors with any concerns or questions and they’ll be there to help me. There is a sense of assurance with the international relations program. By this I mean, I always feel like they will have my back when I need it most. I’m no longer a scared, unsure frosh (as Dr. B puts it), but a prepared, assertive sophomore who is ready to exceed any expectations laid out for me by my professors. The reason behind this confidence is the faculty and students within the program. As my time at SU continues, I hope I can make them proud the way I’m proud to be an international relations major.